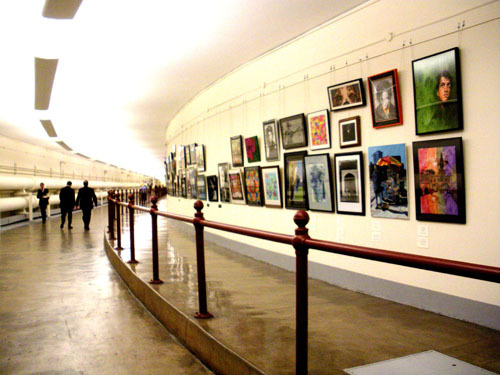 A sprawling pedestrian tunnel system under Capitol Hill allows staffers and members of Congress to securely traverse the office buildings, Library of Congress, and Capitol building largely out of sight. But interestingly, they weren’t built with privacy or security in mind, but rather because of Washington, D.C.’s weather. 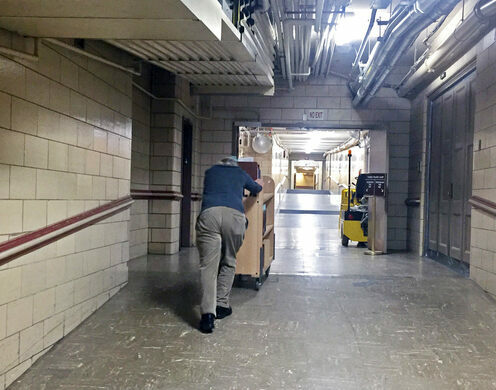 Originally there were only two tunnels, then in 1909 passageways were built connecting the Dirkson and Cannon buildings with the Capitol’s basement. 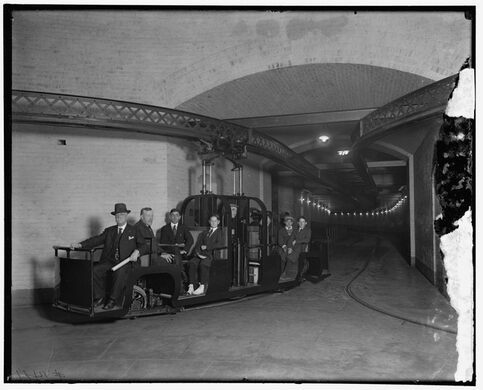 The Senate, accustomed to greater luxury as the “upper house,” explored several people-mover systems for their tunnel. The House of Representatives thought about it, but ultimately decided that their members could walk. 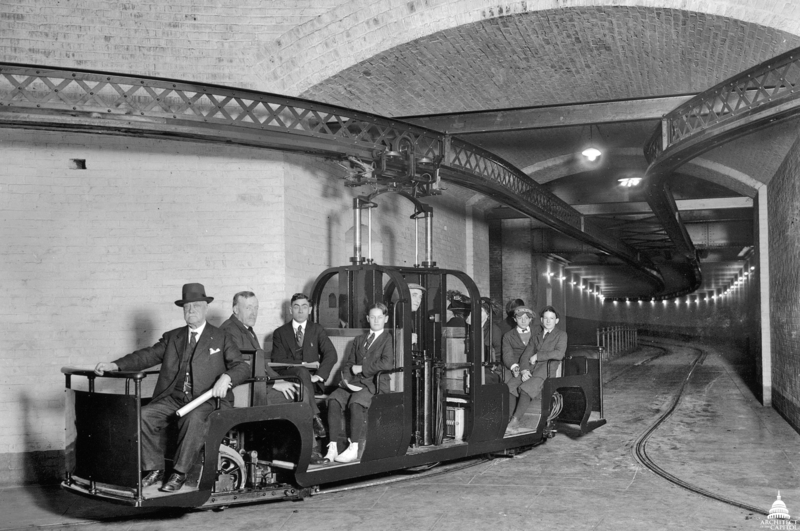 A raised and partitioned walkway in the tunnel shows where pedestrian traffic would have been separated from the never-built House subway. The Senate tunnel was more ambitious. Superintendent of the Capitol Elliott Woods initially wanted to install a Tunis Monorail, an enclosed car that had an aerodynamic shape similar to that of a ship. Passengers would have sat inside on swiveling wicker chairs. They ended up going with a much more modest solution. 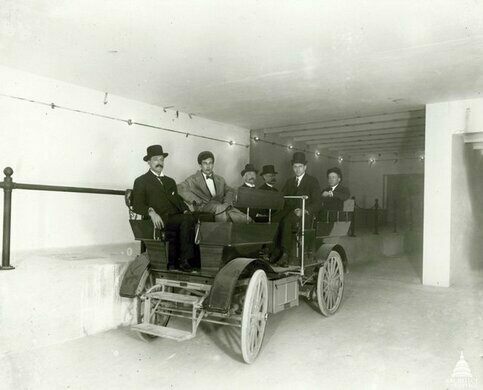 Custom-built Studebaker electric cars were brought in to shuttle Senators back and forth along the short tunnel. Enthusiasm was high for the system when it was initially built. Contemporary newspapers were full of stories about Senators, tourists, and even the Vice President enjoying joy rides on the early automobile. In 1958 when the east front of the Capitol was being expanded, the government built an entirely new tunnel with a station under the Senate steps. 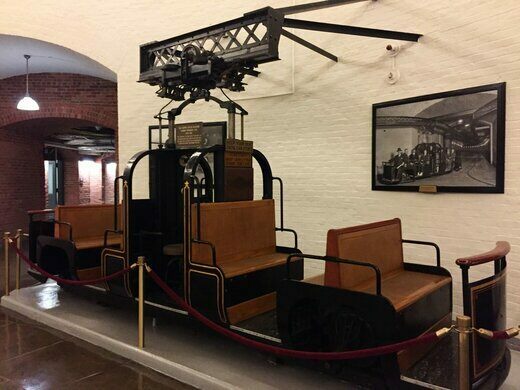 The new tunnel had a modernized subway system, and the old car was moved to the Russell basement rotunda, where you can visit it today. 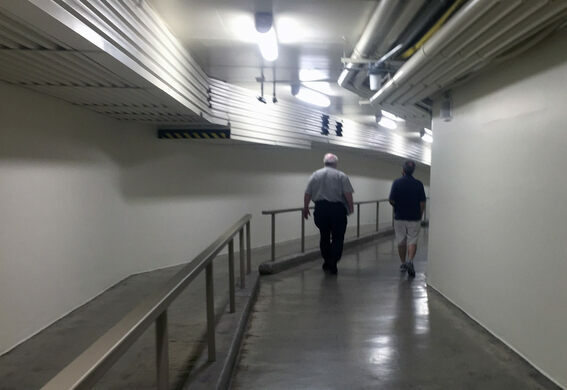 The old tunnel was repurposed for the Senate recording studio, various mechanical shops, and a fallout shelter. You can learn more about the current Senate Subway in this interesting CSPAN documentary. The pedestrian tunnels are open to the public. After his presidency, George Washington planned to live only a few blocks from the Capitol building. The tunnel under the Capitol Building where Congress takes out its trash. Senators used to relax in the nearly forgotten marble tubs now hidden in the U.S. Capitol Building's basement. 100 years later, they're still down there.